The troubled Vermont Health Connect website will be down for weeks to give developers time to address technical and security flaws ahead of the critical open enrollment date of November 15, Gov. Peter Shumlin announced today. Lawrence Miller, senior advisor to Gov. Peter Shumlin, speaks at the press conference on the Vermont Health Connect website. 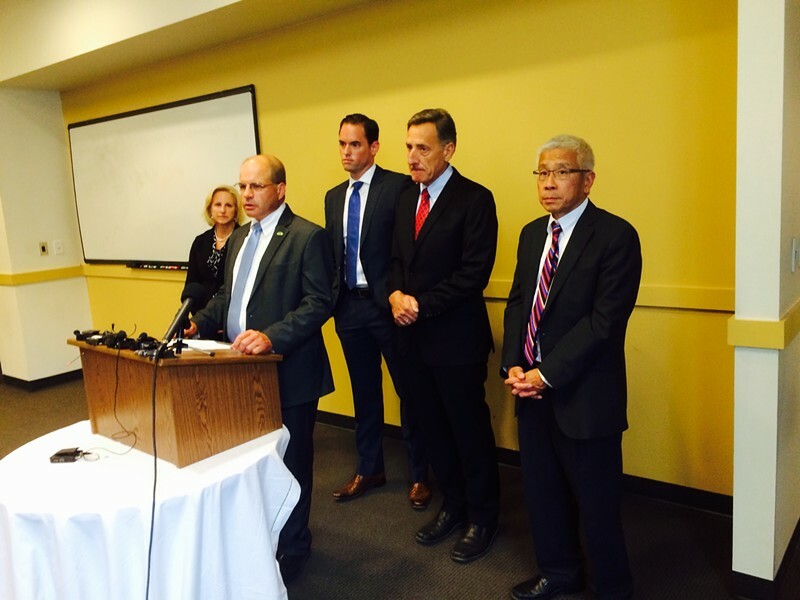 Shumlin and Agency of Human Services Secretary Harry Chen are standing to the right of Miller. Representatives from Optum, the state's vendor managing the project, are also shown. Administration officials said they were being proactive in taking down the site on Monday night and hoping to avoid errors when the next large wave of applicants is expected to hit the site in November, when Vermonters who did not enroll earlier this year will be given the chance to join the program. "We have more work to do to make sure Vermonters have a well-functioning website by November 15," Shumlin said at a press conference in Winooski. "I'm focused on that goal like a laser." Officials repeatedly insisted that there had been no security breaches or other new problems with the Vermont Health Connect website that prompted the decision. Rather, they said, allowing experts to fix bugs without having to manage a constant stream of visitors is the best way to prepare for November. But they repeatedly mentioned concerns about potential security breaches. Lawrence Miller, Shumlin's senior adviser, said the move was prompted in part by "environmental changes from a threat perspective," including the recent breach involving information on millions of Home Depot customers. "We are always emphasizing security. It is looking at the rest of the world and saying, 'Hey, we have some upgrades to make,'" said Miller. "This is precautionary." Administration officials did not provide a timeline for when the site would relaunch, but Miller said it would be "weeks, not days." Vermont officials secured permission from the federal Centers for Medicare and Medicaid Services before taking down the site. While the website is down, Vermonters will be able to enroll in the program via a call center, where the state's new vendor, Optum, is prepared to increase staffing if necessary. The roughly 25 percent of existing Vermont Health Connect customers who make payments via the website will soon receive notice of alternate arrangements to make payments while the site is down. Roughly 30 customers a week are enrolling in Vermont Health Connect using the website, a relatively low number that administration officials insist can be easily handled while the site remains down. Overall, the site handles 750 daily transactions. The state has struggled to fix systemic problems plaguing Vermont Health Connect, the federally mandated health insurance exchange that debuted last October and has frustrated businesses and private citizens who have struggled to enroll and navigate the buggy website. State officials have repeatedly pushed back deadlines and lowered expectations for enrollment goals. Harry Chen, who last month was named interim commissioner of the Agency of Human Services, compared previous fixes to the website to "fixing the car while driving it." "If we keep doing the same thing we're doing we're going to get the same result," Chen said. The administration today also announced a command shake-up that suggests the marginalization of Department of Health Access Commissioner Mark Larson, who has been the target of much of the criticism leveled at the program. At Chen's recommendation, Shumlin moved oversight for the insurance program from Larson's department and placed it under the leadership of Miller, the governor's longtime troubleshooter and former secretary of commerce. Miller will report to Chen. Larson will continue to run other programs at the Department of Health Access. Larson appeared at the press conference but did not speak.